Business.com reported that 77% of customers read reviews online before making a purchase. And you don’t need thousands of reviews like Amazon – Bazaarvoice’s data shows that even one review can create a 10% lift in purchases. Two hundred reviews can boost purchases by 44%. That’s a big deal. With data like that, you’d be crazy not to include customer reviews in your online store. With that in mind, let’s talk about leveraging reviews to grow conversions for your online store. As consumers, we shop with a herd mentality. If a bunch of people purchase the same product or flock to the same restaurant, we assume it must be great. Reviews can help your online store build up this social proof. According to Search Engine Journal, 63% of consumers studied say they’re more inclined to buy from a website that has product ratings and reviews. In fact, PETCO, an online pet supplies website, sent out a survey to customers who had recently placed an order and asked, “What online tool most influenced your purchase decision?” The most common answer – by a long shot – was ratings and reviews. Anytime we make a purchasing decision, no matter how costly or complicated, there’s a level of anxiety involved. When commerce moved to the digital realm, there was a marked increase in purchasing anxiety, which makes sense – it’s harder to hand over money for something you can’t see in person, touch, or test out. Customer reviews can help lessen this anxiety, and the corresponding friction, because the reviewer serves as a proxy by which potential customers can get a better feel for the actual product. 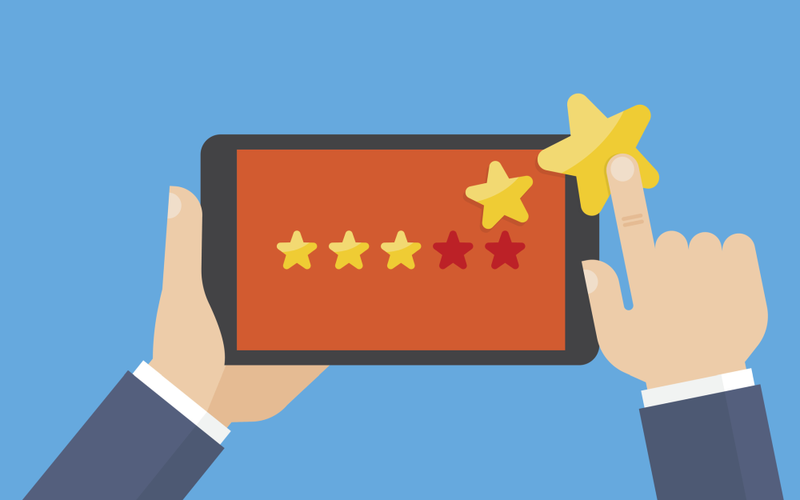 Reviews allow customers to feel as if they’ve tested out the product without ever touching it. In fact, 79% of consumers say they trust reviews just as much as they trust a personal recommendation. However, the vast majority of customers just don’t think about writing reviews. It’s your job to encourage those people to review your products and to do so in the right venue. After all, you want those reviews front and center in your online store, where people are making purchase decisions – not spread across tens or hundreds of Twitter accounts. If it seems simplistic, that’s because it is. Much of the time, the only thing stopping customers from reviewing your products is the impetus. It’s on you to spur your customers into action – and that can truly be as simple as asking for reviews. A free accessory to accompany the product they review. While we’ve only mentioned a two-step process to encourage reviews, doing those two steps by hand isn’t a viable option as your online store grows. That’s why the third step is so vital: you need to automate your customer review process. The easiest and best way to routinely encourage reviews is through triggered emails – emails that go out automatically after a customer takes a certain action, like making a purchase. Create a template of your ask and set it to send the email a certain amount of time after customers receive an order. That way you can sit back and watch the reviews roll in. Now that you have tons of glowing reviews pouring in, how can you leverage them into higher conversions and more sales? There are a few important considerations that can help you get the most out of those customer reviews. Product pages and indexes: Enough said. SERP listing: Including a 5-star rating on your Google search snippet can boost clickthrough rate by as much as 30% – that’s a lot of extra leads. Here’s a handy guide to help. Your About or Home page: Plenty of reviews will veer away from the specifics of the product and into your service and customer experience. You can leverage this kind of customer review on your About and Home pages to help build trust with potential customers, before they even look at your products. They add a level of authenticity to the positive reviews. They make you aware of unsatisfied customers, so you can take steps to make it right and boost customer loyalty. They provide an opportunity to showcase your commitment to customers, even unhappy ones, in a public setting. Moderating reviews is important – it helps to mitigate the potential for offensive, unfair, and off-topic reviews. But for all the reasons above, it’s vital not to fall into the trap of over-moderating and delete every review that’s less than positive. Customers are savvy and will be immediately skeptical if you have a hundred 5-star reviews and nothing else. You’re on your way to seeing oodles more conversions from your online store. Now sit back and watch the sales roll in.